This post is sponsored by I Can’t Believe It’s Not Butter®. 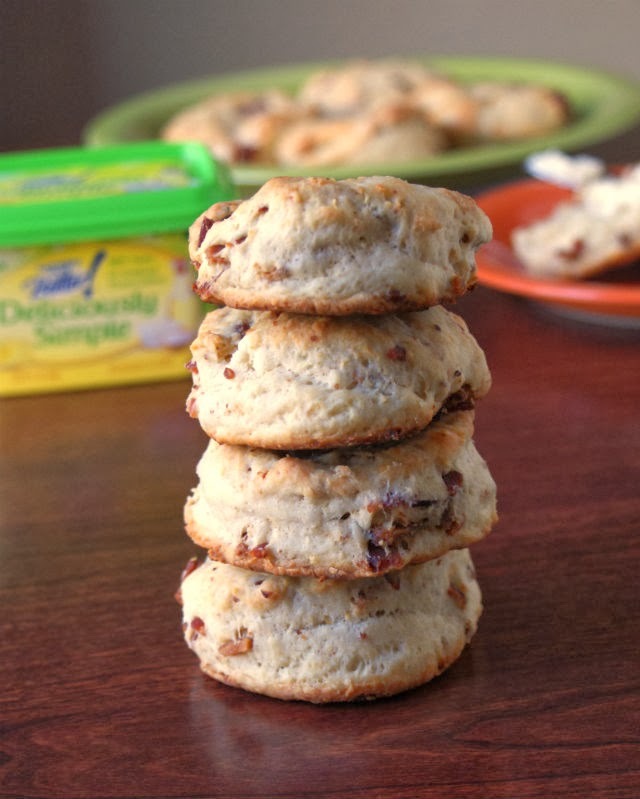 Southern Bacon Biscuits are tender biscuits with crispy crumbled bacon in every bite. I was recently asked to try the new I Can’t Believe It’s Not Butter!® Deliciously Simple™ spread. This new spread has a creamy, buttery taste and is made with simple ingredients like non-fat yogurt and vegetable oil. Sounds good, right? I was glad to see that Deliciously Simple is made with ingredients I recognize and I was really excited to try it out! When I think of good ol' down-home Southern breakfast food, biscuits are what come to mind. Not just the old hockey puck kind of biscuit, though. I'm talkin' about tender buttermilk biscuits. 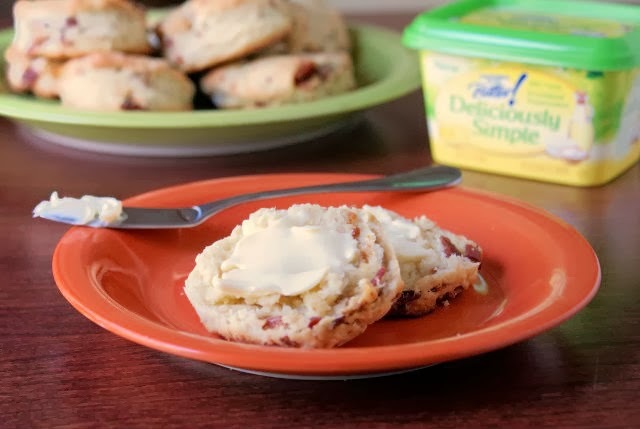 I put a twist on my favorite recipe and came up with these soul-satisfying Bacon Biscuits. Oh yeah, baby. There's crispy bacon baked right into these guys. An entire pound of bacon. You read that right. And I don't feel a bit guilty about it either. Everything feels very zen about delicious little bits of bacon in every single bite. I didn't name them Bacon Biscuits for nothing. I put some salty pecorino romano cheese in them, too. Because this girl loves her cheese. I made the dough, mixed in the bacon and cheese, baked them up to golden perfection, then topped them with the I Can’t Believe It’s Not Butter!® Deliciously Simple™ spread. They were so unbelievably good. I, along with my son and daughter, polished off a half dozen of them when they were right out of the oven. Deliciously Simple™ had the perfect creamy texture for the hot flakey biscuits. (If you know anything about biscuits, you know how frustrating it can be when your trying to spread on a topper and the biscuit just falls apart!). The flavor was great (the same creamy taste you know and love) and it complimented the biscuits perfectly. I can see I Can’t Believe It’s Not Butter!® Deliciously Simple™ being good for so many dishes, sweet and savory, like grilled cheese, garlic bread, waffles, dinner rolls and bagels. I know my daughter will be happy with how easy it is to spread onto her favorite French Toast. She's four and LOVES to help Mom in the kitchen. With 100% Taste and 0% Artificial Preservatives, we give the new Deliciously Simple™ by ICBINB a thumbs up...especially spread onto these sinfully fabulous Southern Bacon Biscuits! Combine the flour, baking powder, salt and sugar in your food processor. Pulse a few times to mix completely. Add the Deliciously Simple in teapoons to the flour mixture. Pulse a few more times to incorporate. It should look like coarse crumbs. Gently press out the dough with your hands until roughly 1/2-inch thickness (err on the side of thicker, not thinner). Cut the biscuits into 2-inch rounds. (You should end up with around 10-12 biscuits, see Notes for biscuit cutting tips.) Place the biscuits onto a parchment lined baking sheet. Bake in the preheated oven for 12 minutes or until the tops begin to turn golden. Use a knife to spread a little bit of I Can’t Believe It’s Not Butter!® Deliciously Simple™ spread onto each biscuit as soon as they come out of the oven. The key to getting your biscuits to rise well is using something sharp to cut them out. A kitchen glass dipped in flour works well. Years ago, my grandfather gave me some old kitchen tools that he had kept since his childhood and among them was his mother's (my great-grandmother's) favorite biscuit cutter...an old tin can. It's a bit rusty now, but I bet that in it's day it cut many a buttermilk biscuit for him and his 12 brothers and sisters! Disclosure: This post was sponsored by I Can’t Believe It’s Not Butter® through their partnership with POPSUGAR. While I was compensated to write a post about I Can’t Believe It’s Not Butter® Deliciously Simple™, all opinions are my own. Isn't using a "healthy" spread on these biscuits a bit like saying "Excuse Me!" after running someone down with a truck? Nothing but a pathetic attempt to covertly schill their rotten, health destroying fake crap into a recipe. "I cant believe its not dogsh*%" should be their new motto. Real butter can be substituted for the Deliciously Simple if you feel like that's the right decision for you. "I'm a foul-mouthed, arrogant child" should be your motto. Becky is earning a living honestly and providing us some excellent recipes. It's called capitalism. She is working for herself and her family, and not taking from others. She does not deserve to be subjected to juvenile, scatological insults from long distance cowards. If the spread ad bothers you, or the contents of the spread itself, just use butter. Just don't get all cranky if you count the calories or fat grams. Yup, substitute to your heart's desire. Enjoy, just don't pig out. Life is easy, moderation is the key, along with some exercise away from the computer. You really should have stated at the beginning that this is an advertisement for "I Can’t Believe It’s Not Butter!® Deliciously Simple™", rather than hiding it in the second Note at the end. Waste of my time even visiting the page...and no, I won't be back to your site, regardless of future content. This post was sponsored by the brand, but the recipe is mine! It wasn't an advertisment, but rather a recipe using a specific product, which can easily be substituted. I never meant to hide this was a sponsored post. I will move my disclosure to the top of the post for future sponsored content and I've edited my past sponsored posts. You won't come back to her site because this is how she earns her living? How generous of you. Tell me, all of you poisonous ones - do you walk into a bookstore and demand to get a recipe book for free? I suppose you do. What a waste of my time. All for an add? Sellout. Working with brands is just one way that I can utilize my love for cooking to help support my family. Writing sponsored content is common for many food bloggers and I'm excited when brands want my blog to showcase their products. I love creating recipes and if I can make a few dollars at the same time, I'm excited that I can generate a small amount of income. If that makes me a sellout, then I guess I am guilty! Take the money and RUN sweetheart ! Those that criticize you for accepting ad money in return for specific product inclusion are TWO FOLD LOSERS. First, they are not competent enough in the kitchen to make their own recipe item substitutions or adjustments and second, they are just JEALOUS. Keep on truckin' love . . . Waste of time? It is an excellent recipe. If you don't like ads on TV, on radio, in magazines, or on the net (basically, in ANY of the media we take advantage of), join a convent and keep your venom to yourself. Thanks! They were so good. I'm convinced people just need something to complain about. Really? We're all adults here, right? The brand paid Becky to post a recipe, and use their brand name. Good for her. We all wish we could be compensated in such a way. Do we realistically complain about commercials or product placement on TV? About how news stories have to use the branded name when they mention a stadium? It was obvious she was being paid when she mentioned the brand. And it's not like we haven't seen these placements before, in many recipes. Even cook books we've paid for. So just enjoy the free recipe that helps keep this site up. And please find something more worthwhile to whine about! Becky. I'm not into using butter substitutes, but I don't mind you hawking their wares for them. I'm intelligent enough to make my own decisions and competent enough in the kitchen to make any substitutions I feel necessary. Recipes are just guidelines to me anyways. To those complainers I say, stick it in your ear! You've got nothing to complain about! Becky, you made no effort to conceal yourself in the matter and some people just can't read or think critically. first time at your site, and I enjoyed it. Becky, I can't believe so many are giving you such a hard time for writing a sponsored post! I don't see what the big deal is, and I admire you for how well you have handled it. Bravo! I'm with you Becky. I would do it in a heartbeat...simple recipe...money made. It's all about family and supporting them the best way you can. Kudos to you! Not a true southern style bacon biscuit, not eve close. Alright, you got me there. I know a true southern style biscuit doesn't have sugar, but I decided to throw a little in at the last minute to balance all of that salty bacon and cheese. And using self-rising flour like White Lily is common with southern biscuits. I probably should have put that in there, but I lose my head sometimes and generalize things a bit. Got any tips on making them more southern or any southern biscuit making secrets? I'd love to hear them! Because ICBINB has so much water in it, plus stabilizers didn't it kind of muck up the texture of the biscuit? PS. I got a chuckle thinking about slathering a so called healthy spread on something as calorie and fat riddled as cheesy bacon biscuits but I guess this is the crazy world we live in. The sugar is a brilliant idea. Good for you. PPS...they look great. This recipe reminds me of Italian Lard Bread, which is all about the salty meat and cheeses, so I'd use lard as my fat. And I would NOT use ICBINB on them. Either butter or nothing. The texture was good for me. The flesh of the biscuit was nice and tender. They didn't rise quite as much as I would have liked them to, but I atttributed that to all of the bacon and cheese I addeed in. Lard would work too, I'm sure. I actually considered using bacon grease as a portion of the fat component of the biscuit. But then I thought to myself, "Not everyone is as bacon-obsessed as you are, Becky. Rein it in a little. You already included a freakin' pound of bacon." I'm totally going to google Italian Lard Bread. Sounds right up my alley. 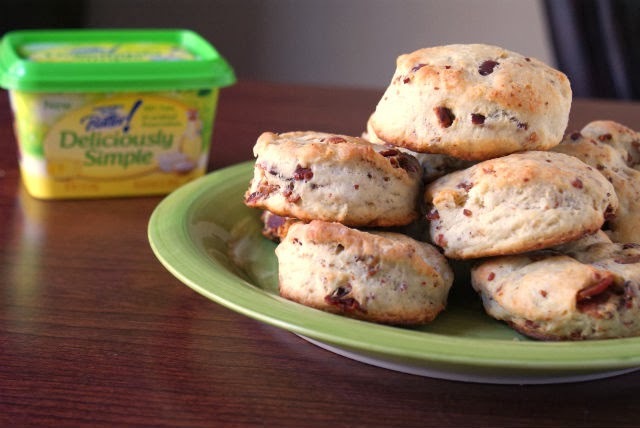 When I make these biscuits I'm going to slather them with slices of CostCo unsalted butter. It makes absolutely no sense to ruin a recipe like this by using a flavored industrial lubricant, I suggest you try an experiment. Open a container of this industrial lubricant and place it where bugs and animals can get to it. They won't eat it and it won't rot. Wow! Hot topic apparently. I prefer real butter, but I could list so many other shameful foods I indulge in. I wish I could eat perfectly all the time, but alas, sometimes those convenience products find their way to my plate. And, often times I even like it. It's about balance, right? As long as you liked your recipe and your post then you aren't a sellout, either! There will always be "naysayers" as long as we live and breathe. I have learned to eat what I want "in moderation". That is the key for me. What I hate more than anything else is some naysayer dictating what we "should or shouldn't" do. They need to get a life and learn to moderate for themselves, not for everyone else. Wow. Do any of you gripers earn a paycheck? Or is it given to you because of your good looks? I earn my check by working for a, GASP, Food Processing company. Guess I should turn myself in to the local sheriff department. This recipe looks great, Becky. I'm looking forward to trying it, the Food Police and Anti-Capitalist Creeps be darned. Not sure why there are those that have a problem with a sponsored post. Let's get real, Halle Berry is not using Revlon to put on her make-up. Beyonce is not using store bought dye to color her hair. The list could go on and on. The Kardashians don't even wear their namesake make-up or clothing. Don't even get me started on the obvious product placement on The Fosters. If you think that they are, I have some snow in Alaska that I want to sell you. Yet, I don't ever see anyone knocking them for earning a living. I just don't see the big deal about bloggers making money. It's ridiculous. Yum! I'm gonna try the bacon and cheese with Bisquick! Becky, I understand why you list the product you have. I have a challenge for you. ( wont get a pay check for it tho, ) I've made cakes subbing apple sauce for "grease". I will try it or finely graded apple in the recipe--meal in a biscuit :) Biscuit lover here too. Thanks for all you share! I have heard of doing that, but I have never tried it. Thanks for the tip!